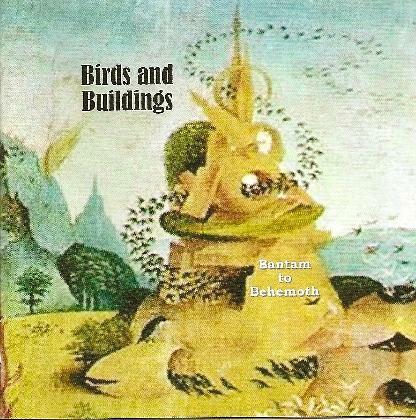 Birds and Buildings - "Bantam to Behemoth"
Anyone remember Deluge Grander? It was a great progressive rock CD released a year or so ago. Anyway, this is a side project of sorts for musical leader Dan Britton. The CD is a series of 3 sets of 3 tracks that link each other together with the use of similar themes at the beginning and/or ends of the tracks. The CD is a quasi-concept album dealing with conflict, collision and evolution and features some really cool artwork (thank you H. Bosch and K. Terracciano). The CD begins with Birds flying into Buildings and you are burst straight into a jamming track with some cool spacey elements as well. Features cool solos on guitar, sax and keys. Terra Fire is a short piece with some ethereal vocals and is quite melodic. This leads into Tunguska, with its lush sound and acoustic guitar and great flute playing. This track really builds up and gets quite intense. The next 3 pieces are all about 10 minutes each, starting with Caution Congregates and forms a Storm, which starts with acoustic guitars, keyboards and a very lush sound and nice some amazing lead bass playing that leads into the strange forest that the band is now taking you as the music builds intensity and swings back and forth with amazing playing. Chronicles of the Invisible River of Stone features the female vocalist Megan Wheatley. Yucatan 65 starts with some great flamenco like guitar and flute but really builds in intensity and is an amazing track. Chakra Khan also is a very intense track with great keyboard playing and some stuff that reminds me a lot of Kansas but with some intense saxophone playing instead of violin. The last part of this brilliant CD ends in a quiet way. Wow... amazing stuff.